It is estimated that the Founding Fathers took approximately 116 days to write the United States Constitution, counting all of the drafts and revisions made during the Constitutional Convention. 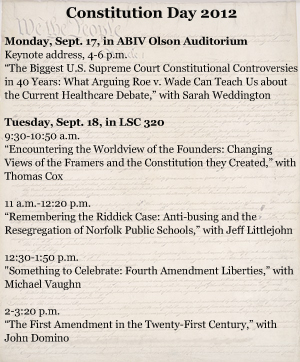 For two days, Sam Houston State will join in the 225-year tradition of interpreting those words by bringing together a renowned expert on Roe vs. Wade, perhaps the most controversial of the Supreme Court’s constitutional rulings, and various faculty members to discuss issues related to the document as part of the annual Constitution Day celebration. Activities will begin on Sept. 17, when keynote speaker Sarah Weddington will share her thoughts on Roe vs. Wade from a unique perspective—as the winning attorney in the court case. Her presentation—“The Biggest U.S. Supreme Court Constitutional Controversies in 40 Years: What Arguing Roe v. Wade Can Teach Us about the Current Healthcare Debate”—will be held from 4-6 p.m. in the Academic Building IV Olson Auditorium, in room 220. On Tuesday (Sept. 18), a series of presentations will be held in Lowman Student Center Room 320, facilitated by SHSU faculty members. Beginning at 9:30 a.m. Cox will discuss a topic that has been hotly debated by political candidates over the past few elections, the framers’ intent. “Encountering the Worldview of the Founders: Changing Views of the Framers and the Constitution they Created” will explore scholarly interpretation of the document. Michael Vaughn, criminal justice professor, will follow Littlejohn for a presentation that will focus on “Something to Celebrate: Fourth Amendment Liberties” at 12:30 p.m.
“While President Bush received criticism for the Patriot Act that allowed increased law enforcement involvement with less judicial oversight, President Obama has continued the War on Terror with as much vigor,” Vaughn said. “As the War on Terror has increased, some have suggested that the Fourth Amendment has been degraded by aggressive law enforcement practices, including fewer privacy rights for Americans' persons, houses, papers and effects. Finally, political science professor John Domino will round out the Constitution Day celebration with a modern-day look at the United States amendment guaranteeing freedom of speech beginning at 2 p.m.
“The First Amendment in the 21st Century” will explore how Americans view the amendment today and why it has remained such an important part of our political culture, as well as examining the amendment in light of important recent constitutional debates and Supreme Court cases. Each Constitution Day attendee will receive a copy of the “The Hip Guide to the United States Constitution,” a pocket sized copy of the Constitution with commentary on the history and meaning of the document. 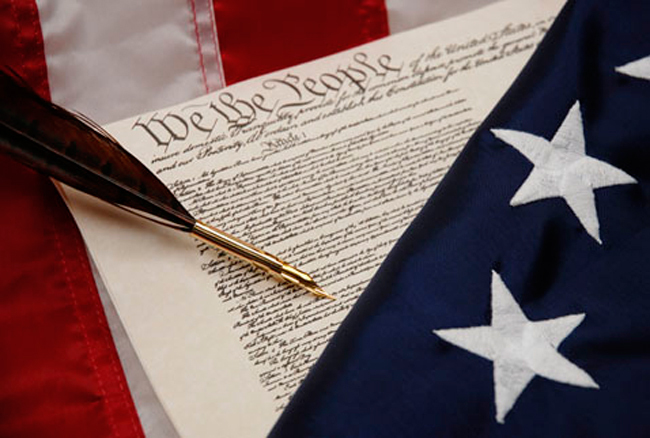 The Constitution Day celebration is sponsored by the SHSU American Democracy Project, the departments of history and political science and the College of Humanities and Social Sciences. For more information, contact Cox at 936.294.4804 or thc001@shsu.edu.